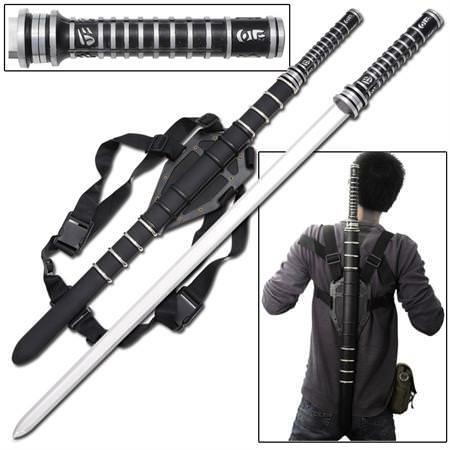 Daywalker, the vampire who is immune to daylight, uses a fierce weapon, a strait blade katana. This is the genuine vampire masterpiece in a full stainless steel form. Unique characteristics of the mirror polished blade include the double sided, factory edge. 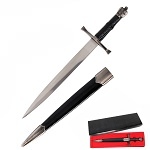 The rigid blade is 4mm thick and can be professionally sharpened. 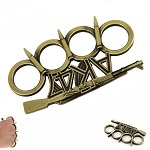 The full aluminum handle is a single solid piece with a ringed ridge grip, as the second unique trait. 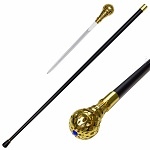 Additionally, this sword includes a genuine wooden scabbard. It is fully wrapped in black with polished metal rings. Unique characteristic #3: flat back support with thick nylon straps. The 6 inch wide back support is hard with a foam padded back to ensure comfort. 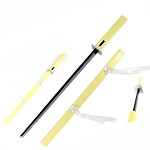 This sword can be placed on the back with arms through the straps to support it. A center strap goes across the front.